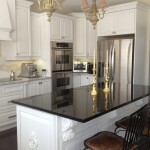 Sharrard Painting & Fine Finishing specializes in providing Kitchen Cabinet Spray Painting / Kitchen Cabinet Painting and Furniture Refinishing services in Toronto and the surrounding areas. 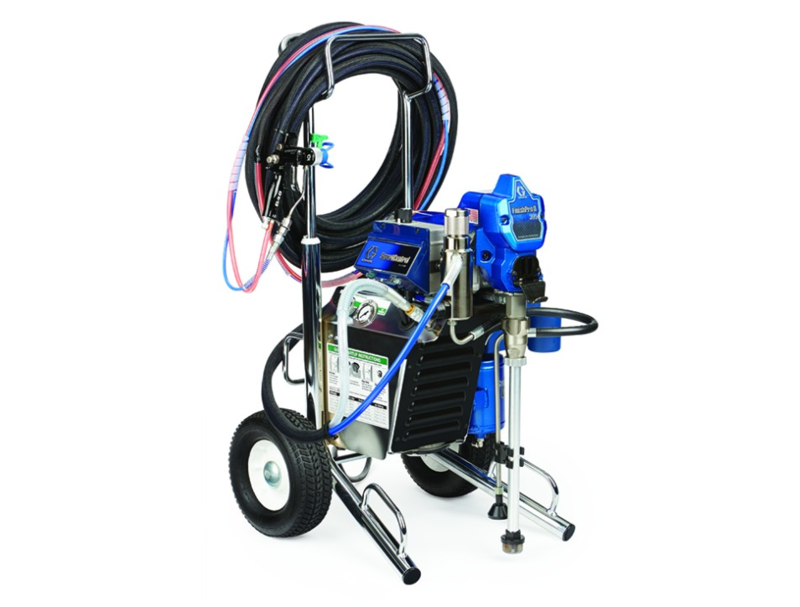 We provide both on-site and off-site fine finish spray painting services using airless and HVLP sprayers. 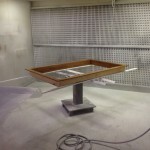 Our professional and state-of-the-art spray painting & finishing facility is located in Oakville, Ontario. 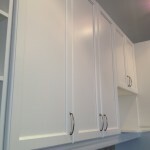 Contact Us for your free cabinet refinishing estimate. Kitchen cabinet refinishing projects can take a week to three weeks to complete depending on the level of service required. 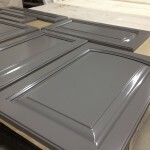 If the customer drops off the pieces we can usually turn them around quickly but we find that customers typically want their entire cabinetry professionally spray painted (the gable ends, kick plates, crown, valances, etc.) not just the re-moveable pieces such as the doors and drawers. 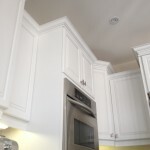 A complete kitchen cabinetry overhaul, including gable ends, kick plates, crowns, valances and decorative spacers will usually involve 3 to 4 trips to your house. Step One: get a free project estimate / assessment. This is done typically via email (with pictures sent in by you) but may be done over the phone or in person. Step Two: conduct an on-site survey. Done after the assessment is done. The scope and requirements are validated, samples and colours reviewed, The final price of the project is determined. Step Three: we start by first picking up the doors, drawers and any other items we thought could be more effectively finished at the shop vs. in your home. 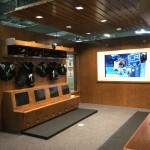 Step Four: completion of the on-site work. We spray paint the base cabinets, gable ends, kick plates, crowns and valances on-site; basically all the stuff we could not take with us. Depending on the size of the kitchen this will take one to two days to complete. 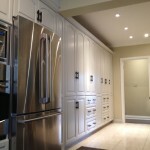 See this article for complete details regarding the spraying of on site cabinetry. Step Five: we re-install and re-align your cabinet doors and drawers. 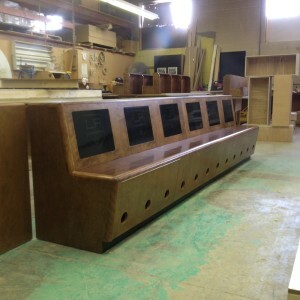 Waiting for the first coat to dry. 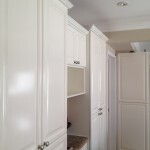 Serious cabinet refinishing work requires the use of lacquers and not traditional house paints. 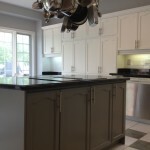 The majority of kitchen cabinet refinishing jobs done by Sharrard Painting and Fine Finishing use a post catalyzed solvent based lacquer system. We do not use water based paints or water based lacquers ~ these products simply do not have the durability and the longevity required for finishes in kitchens and bathrooms. The SUMMIT line of conversion coatings from Katilac Coatings under distribution from Halton Chemicals is our go to SOLVENT BASED lacquer for kitchens and bathroom applications. Durable surface – very good hardness, block resistance and print resistance. Excellent mar resistance. Cannot be applied using brush and roller technique, requires spray application. Has a higher VOC content than water based lacquers and can only be sprayed in residential situations provided the rent venting in in place (i.e portable air exchanger). Multiple coats can be applied in the same day. 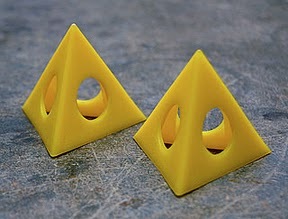 Primer and paint can be sanded within an hour of its application. Sands to smooth and fine powder, not gummy. 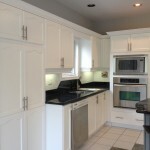 As a professional interior painter in Oakville, Mississauga, Burlington and Milton, I often get requests to provide advice on painting and refinishing cupboards and kitchen cabinet doors. This article covers the traditional methods and tips used for painting and refinishing cupboards and kitchen cabinets using both waterborne lacquer paint finishes, such as Kem Aqua by Sherwin Williams, and Advance, a waterborne alkyd manufactured by Benjamin Moore. If you are thinking about painting your kitchen cabinets or a contractor who has been asked to paint up a set of cabinets then consider these handy kitchen cabinet painting tips. Sharrard Painting specializes in the finishing and refinishing of cupboards & kitchen cabinets. So if you’re attempting the project as a DIYer here is some free advice from the professionals. Picking the right primer is critical so be sure to match the paint to the primer, and the primer to the surface being painted – i.e. read the side of the can and use that product for your base primer coat. Surfacers (Lacquer Primers): most lacquer finishes have a compatible surfacer that is available for use in both waterbased and traditional solvent-based systems. These primers build up the surface and provide easy sanding with sanding grits typically in the 320 to 400 range. The water-based systems are nice for clean up but they will not seal the wood as well (stains) and typically don’t sand as nicely. You’ll use more sandpaper with a waterbased system since the primer will clog the paper and not release like solvent-based surfacer. 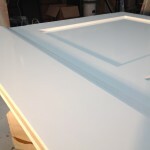 There is absolutely nothing wrong with using oil or solvent based primers and water-based top coats. If your cleaning has been sub-par then an oil based primer coat will save you. Yellow Stains Bleeding Through the Primer: if you’re seeing a lot of yellowish stains bleeding through the primer you should spot prime with a pigmented shellac based primer or apply another coat of primer. If the yellow stains continue then you will need to apply a complete coat of a stronger shellac based primer such as BIN. If not dealt with properly the yellow will bleed through to the final coat and many, many coats of finish paint will be needed to cover the yellow stains. The yellow stains will be especially annoying if your painting the kitchen cabinet doors white so make sure you deal with this. Google the keywords “tannins in painting” for more information. Label Every Drawer, Hinge, and Door: Drawer fronts and doors must come off. Be very detailed when doing so – the hinge is also labeled to the door it was previously being used for). The hinges are labeled in the up and down orientation – this saves you from having to realign the doors. I use the alphabet (e.g. A, B, C, D) to label the upper cabinets and numbers (1, 2, 3) to label the lower cabinets. And on the back of the hinge I write its details (these are concealed after the re-install). So cabinet door A (is the left most door or drawer), it has an AT (Top) labeled hinge and AB (Bottom) labeled hinge. Cabinet door number two is a lower cabinet door second from the left and would have two labeled hinges, 2 – T and 2 – B.
Prep Work: scuff sand the entire surface. You do not need to remove the entire coat of varnish but you do need to scuff it well. This is the hardest part so be sure to distribute your effort evenly between the doors. You’ll be all gung-ho to start and can easily put up to 20 minutes into the first door – now times that by 22 pieces and your into 8 hours of prep before you even begin painting. Tools: if you cannot spray paint the cabinet doors use a 3 inch low profile roller (4 mil or less). Wrap it with tape first. Pull the tape off, if there was a lot of hair / fibers left on the roller that’s the first sign your about to destroy your cabinet doors with a cheap roller sleeve. I prefer to use a low pile microfiber roller. The foam roller may provide a finer finish but you may need more coats of paint. As well some waterborne alkyds such as BENJAMIN MOORE ADVANCE are not recommended for foam rollers – too many bubbles in the paint. 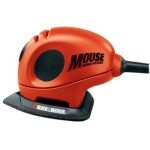 Mouse sander with 120 / 150 grit pads for initial sanding. 220 pads for sanding between primer coat and finish coat. If you plan to brush and roll your cabinets use a tiny roller like this. Coats of Paint: if you’re spraying the doors consider two coats of primer and two coats of paint per side. Or add the extra coat of primer to the fronts only and make sure you sand between primer coats with a 220 sanding pad. Use grey sanding pads after the first coat of paint. 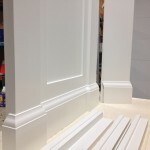 When sanding between finish coats (not primer coats) you will leave lines or scratches in the paint if you use anything less 400 grit paper – especially when you’re using a lacquer based product and especially when you spray. This is why I recommend the gray finish pads. If you are trying to achieve a truly professional paint job you cannot paint both sides at the same time. The doors need to be laid flat when drying and suspended off the surface of the table or floor (sets of Lego blocks can also be used). Always paint the backs first (this allows you to work out your technique before moving on to the highly visible fronts). Painting Tips: If you’re not going to use a sprayer to do the doors then try to use the brush as little as you can. The brush is loaded, each corner of the detail is dabbed with the wet brush and then stretched out along the groove in both directions towards the center. Find that balance between the amount of paint needed to lightly cover but not create any sags or runs. Remember you’re putting on three coats (1 primer, 2 paint) – it will cover nicely by the final coat and if you try to make it cover on the first coat it will look awful. 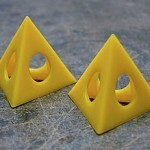 Painters Pyramids – Use to keep doors flat and off surface while painting. Sags: keep an eye of out for these. Don’t wait an hour to inspect your work because by then the paint is too dry and if you touch it with a brush or roller it will be sticky and create quite a mess. After every second door or so go back and inspect the last two doors painted. Look for sags in the corners, edges and the edge underneath the door being painted. 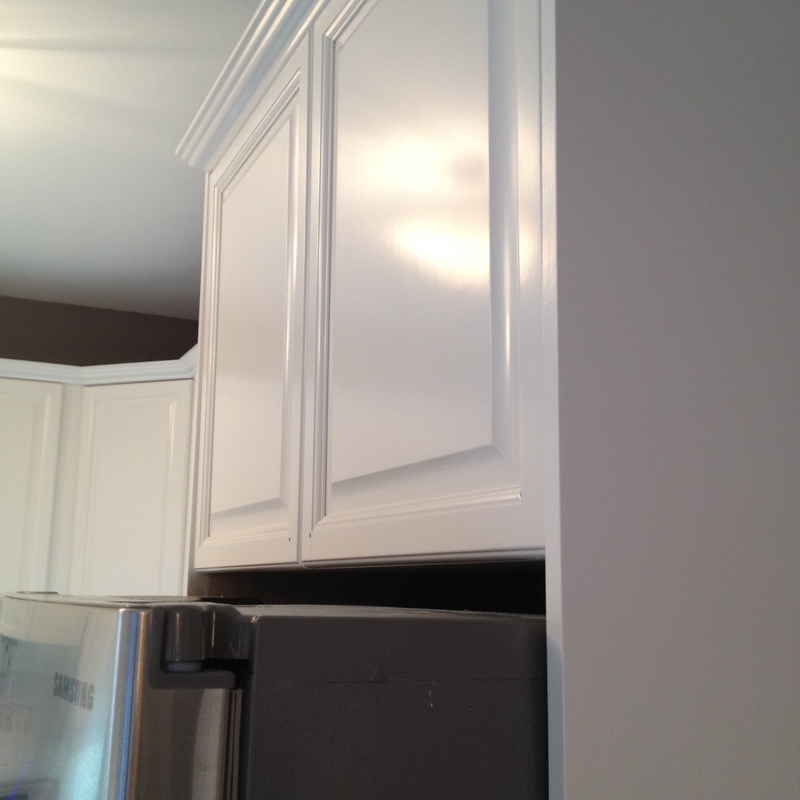 Base Cabinets: The base cabinets can be very difficult to paint compared to the doors. The angles and narrow strips make them very prone to sags and runs – keep the coats of paint and primer thin in these areas and check for sags frequently. 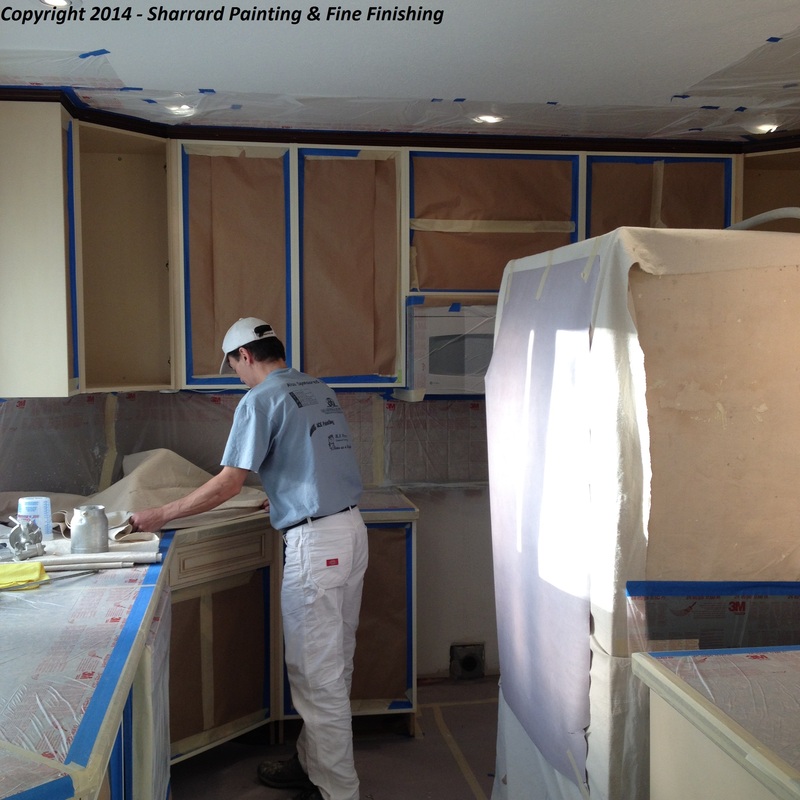 Spraying will produce the best result but the labour required to tape up the kitchen can be intense. 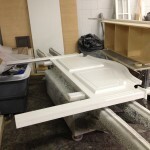 See this article for complete details regarding the spraying of on-site cabinetry – Spray Painting Base Cabinetry. 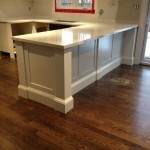 Cabinet carcasses are taped up with 12” paper, flooring paper (called Anchor Paper – available at Dulux Paint Stores is used on both the floors and counters. 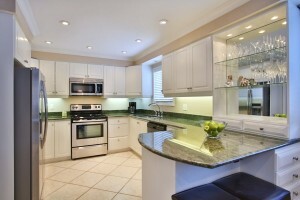 Non-Flaking 24” film from 3m is used required – typically on the ceiling and backsplash. For a real professional result you need to evenly apply the tape around the carcrass about 1mm back from the edge banding. Using blue tape can sometimes provide the contrast you need when painting the edge banding on an already white cabinet. 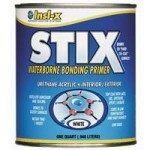 Touch Ups: Don’t confuse uneven paint and blobs for sags, sags are runs in the paint cause by thick paint and gravity. Uneven paint that is dring will stay wet longer than the rest of the door. A rookie painter will see this as an imperfection and try to hit door with a roller to “level” out the uneven paint. Unless this is done within 5 minutes of the door being rolled you will see, once the paint has dried, the touch up you made (e.g. a brush mark or uneven stipule if using a roller). Its better to allow the paint to level itself. Uneven paint distribution across a surface will likely not be seen once the paint has completely dried and cured. Doors and Drawers: for estimates, the actual effort I calculate is about 60 to 90 minutes per door. Factors like sanding, filling cracks, the detail and the amount of washing make up for the variables. 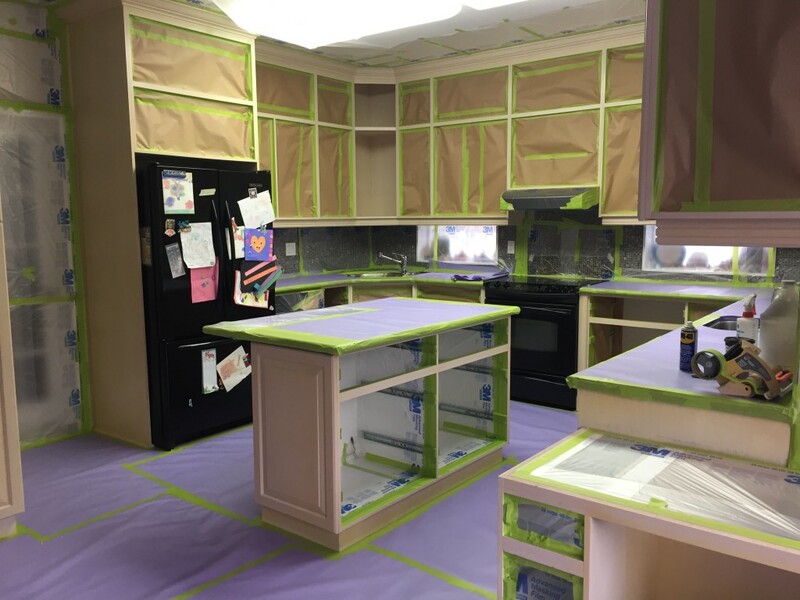 Base cabinets – if the base cabinets are to be spray painted it will take two professional painters a day and half to two days to wash, tape, prime and paint the base cabinets in your typical 35 to 55 piece kitchen. 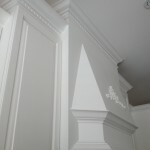 If your simply painting them then the time will be significantly less because you will not need to do the taping. 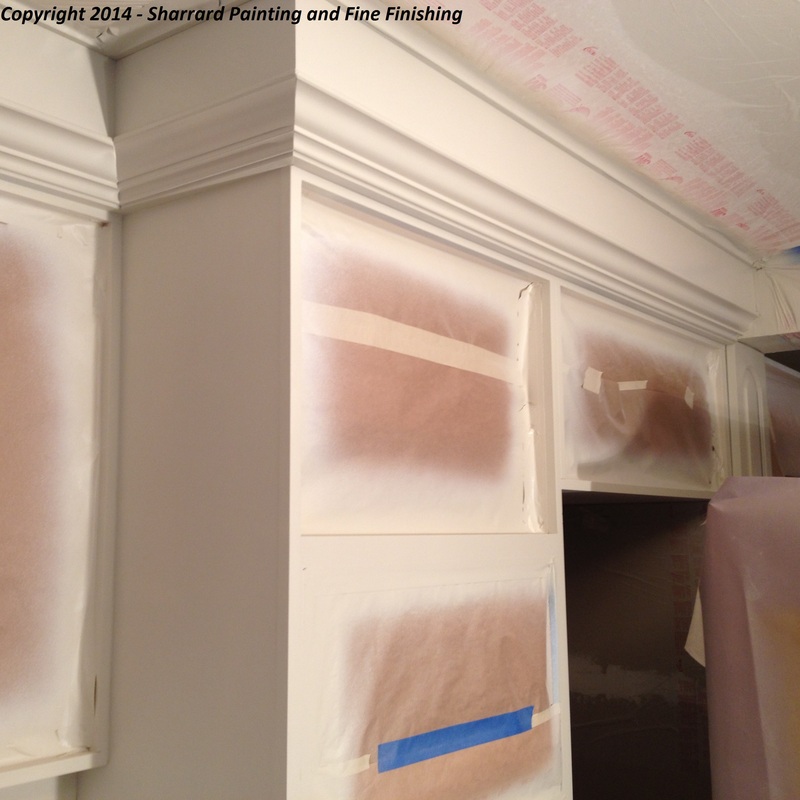 Materials – if spraying the base cabinets you’ll need about $70 to $90 dollars in tape, plastic & paper. You will need about 2 Gallons of paint and two gallons of primer / expect to use twice that much if spraying and using lacquer. Pigmented shellac primer (about $75 per can) is required for oak or as an alternative to primer or both shellac followed by surfacer. Deconstruction and Reconstruction of the kitchen: don’t forget to include time to deconstruct the kitchen and reconstruct the kitchen. Additionally, the doors need to be packaged for return to the customer’s house (i.e they need to be bubble wrapped). Estimate about 20 mins per piece to take them off, transport, label, and then when refinished, packaging, transport and re-installation. 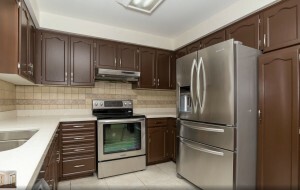 Two trips to the customer’s house with a 45 piece kitchen is 900 minutes or 15 hours ~ approximate one day for a crew. Averages: a crew of two can guys can usually refinish a 45 piece kitchen with one week of effort, that’s two days on site, two days in the shop to prep and finish boards and one day for teardown and reconstruct. Chances are you cannot do the process in 5 days straight, to properly finish the boards you would need to prime one day (both sides), one day to finish the backs, one days to finish the fronts. You want about 12 to 16 hours of dry time before you flip the boards over to finish the fronts or else you risk leaving marks on the backs of the boards caused by resting on the drying rack. A) Take them off: Remove, label doors and all other hardware. 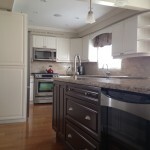 See our blog post on Tips for Painting Kitchen Cabinets for more information about this. B) Wash Doors: unfortunately not an optional task, all doors must be washed with tri-sodium phosphate or a comparable de-greaser. It’s almost a type of dry washing since the doors cannot get too damp or else they will warp, loosen or suffer other damage. You need to scrub up, rise and pat dry each door in a timely fashion. Remember this is wood you cannot let it soak in the tub for an hour to get 10 years of grease off. Thicker layers of grease can be removed gently with scrapers and flat blade razors. Insure the doors are dry before sanding. Use old finishing pads or old sanding sponges and wet sand with the cleaning solution. C) Sanding: scuff sand the doors and sand out sags and runs from the previous finish. Scuff sanding means 5 to 6 quick passes with sandpaper. Use sanding sponges for the groves and expect to use a lot. The smaller cheap ones are easier to use but only last 2 or 3 doors before they need to be replaced. 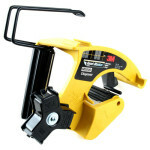 Using a combination of spade-shaped mouse sander for the corners and orbital sander for the front and sides and you will save a lot of time. Be systematic in your approach to getting the work done and not missing any corners, sides or fonts. For the initial sanding of the varnish coat use 120 – 150 grit sandpaper. Don’t polish the varnish with higher grit sandpaper. Use 150 if you’re new to using those tools. Practice sanding on the backs of the doors. 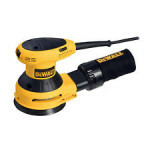 A moving orbital sander can leave rotation marks on the surface if not placed on to that surface correctly. Dust, consider doing the sanding outside if possible and wear a mask to protect your lungs from the fine varnish dust. D) Dents, Cracks and Holes: Now is the time to fill small holes with wood filler. The Le Page Tinted Wood Fillers work well in most applications. 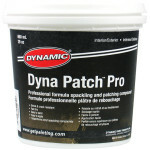 Avoid using latex caulking such as DAP to fill in cracks, over time it will crack and weather poorly. The tinted wood fillers can be used just as easily, as well they can be sanded smooth unlike latex caulking. E) Modifications: If changing door hardware now it is the time to see if it fits correctly or needs to be moved. Drill new or larger holes as required now and not on a freshly painted door. 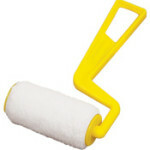 F) Dusting: completely dust the doors, remove all dust, use dry paint brush to sweep out cracks and be very detailed. Vacuum each piece to remove all the varnish dust, a bristle vacuum attachment works well for the detailed job. G) Clean up: vacuum your work area and get ready to paint. H) Drying Station: if not already done construct a drying station. 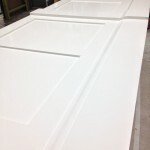 A professional lays out all the doors in advance and ensures that a freshly painted door can be removed from the paint station and placed onto the drying rack without any of the wet paint being touched. I) Prime coat: Match the primer to the paint and the paint and to the surface being painted. 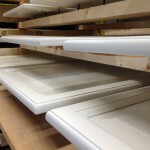 Prime the backs of the doors first and follow the manufactures instructions for dry time. Flip over prime the other side. J) Sand: Using 220 grit sandpaper do another quick scuff sand after the primer coat has completely dried and completely dust and vacuum the door prior to the first coat of paint. Use a dry paint brush as a fine whisk to get into the corners. 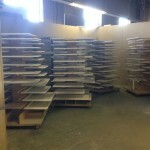 If possible take each door outside, or away from the painting station to avoid dust contamination at the drying racks. K) First Coat of Paint: paint the BACK of the DOOR first (both coats of paint). If you paint the backs first any marks left from the painters’ pyramids (only if you’re in a rush) will be on the back of the door – drying time is as per the paint’s instructions. Overnight drying before flipping the doors and painting the fronts is recommended. Water-based enamels such as Ben Moore Advance will need a full 16 hours of dry try between coats. While the paint may feel very dry after 5 to 6 hours I never attempt any repaints prior to the interval of time recommended by the paint manufacturer. If the first coat has not cured enough the second coat will soften the first coat creating thick and unsightly brush marks. 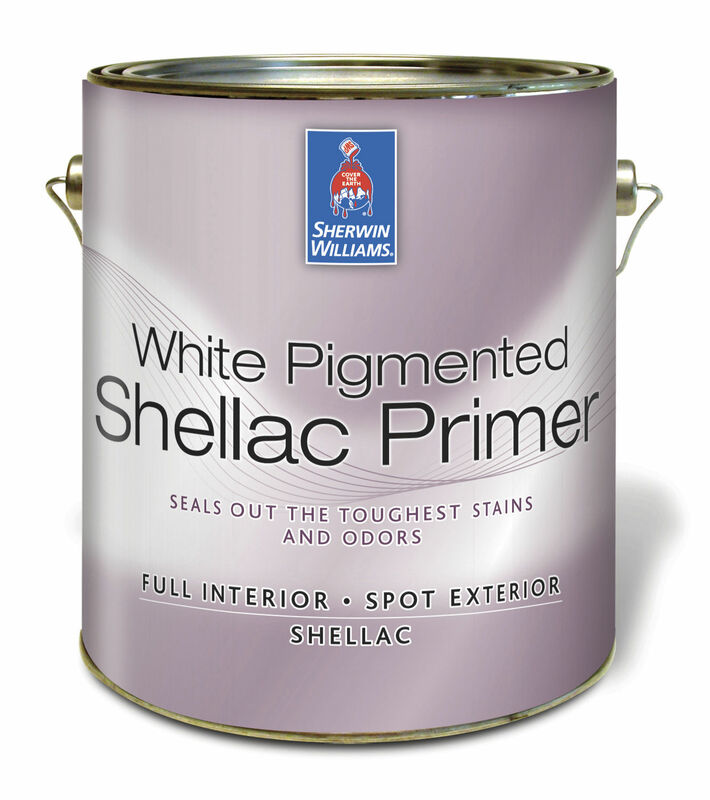 Yellow bleeds or stains coming through white primer are a sign you need to use an oil based primer with shellac such as BIN by Zinsser. If not dealt with the yellow will continue to bleed through to the finish coat. If the yellowing is only is only in a few spots then use a spray can of BINs and only spot prime. 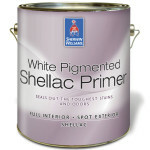 If the yellowing is extensive you will need to apply a complete coat of the BINs shellac based primer. L) Painting the Sides: each time you paint a door do the sides lightly (not to thick) with a roller. Use light coats on the sides because you end up putting 3 coats (1 primer, 2 finish) on the each door (technically because you paint the front and back of the door you get to apply up to 6 coats on the sides), Never use a fully load roller sleeve on the sides, the paint will run over the edges and you’ll get sags. I always use a depleted sleeve, i.e one that you have just used to paint a larger surface with (the front) and one that has relatively little paint left in it. M) Second coat of paint: Between first and second coat use 320 grit sandpaper. If it’s not covering completely after the second coats don’t force it, just accept that you’ll need to apply another coat. You likely applied too light of a coat during the primer or painting process or both but that’s OK since the end results of applying the paint to thick would be much worse. N) Dry Time and Re-hanging the doors: Within hours the surface is dry to the touch but the paint is still soft and will scratch, chip or scuff easily. During the initial week of drying try not to handle the doors too much initially and don’t try to hang the doors before they have begun to fully cure, this takes about 5 to 7 days. 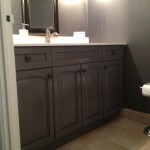 Here is some handy notes for the local cabinet painting contractor in Toronto, Mississauga or Oakville area. 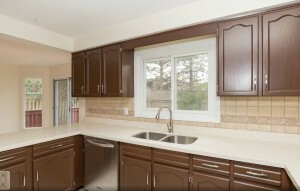 If your thinking of providing cabinet refinishing as a service these are some factors you need to consider. Space: to paint doors and space to allow the doors to dry and cure. 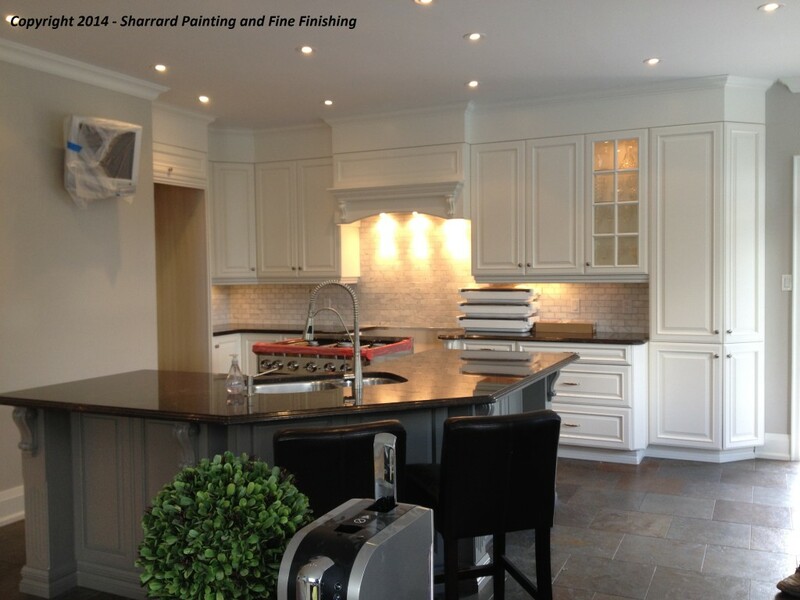 Sharrard Painting & Fine Finishing has a 2500 sq ft painting and fine finishing shop with a compliant spray booth located in central Oakville. Dust: created by sanding, keeping the doors dust free between coats is key to keeping presentations of your work from looking like crap. Completely clean up (vacuum * 2) prior to primer coat and finish coats. Grease and Dirt: has to be removed – it is one of the most critical and yet overlooked steps in the entire process. You can actually do some sanding and washing at the same time if you use burgandy finishing pads as a scrub pad. Removal and Rehanging of doors – putting them back up will take twice as long if you’re not the guy who took them down. 18 Doors can take an afternoon if there are lots of adjustments to be made. 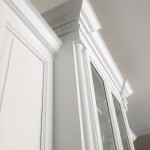 Your customer will expect you to create level cabinet doors and to fix any rubs the drawers might have had with cabinet doors. These have to be fixed because the rubbing of the doors will scratch of the paint off within weeks of you declaring your done. If the customer can be responsible for removal and rehanging of the doors you might want take this approach. You can establish better boundaries around what you’re doing and will need to perform less `miracles` – eg getting another month out of that rusty hinge vs being blamed for breaking it when you tried to remove it from the door. 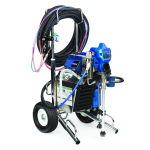 Graco 395 Fine Finsh Pro – Air Assisted Spraying provides the best finish possible. Spray: If you decide to move into spraying remember you`ll use twice as much primer and 3 times as much paint. 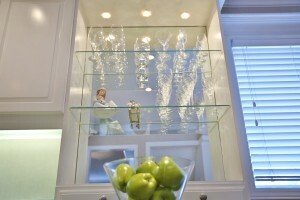 You can achieve a great “out of box IKEA cabinet effect“ using an airless with a 311 tip. If you have the space, a table top Lazy Susan and a good drying station, it’s not a complicated project to complete. 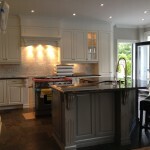 Sharrard Painting spray paints all cabinet finishes but we do it off offsite at our shop in Oakville. 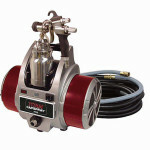 We use an air assisted Graco 395 Fine Finish pro for spray painting of doors and accessories. Transporting the doors: if recently painted they will easily get damage during the move. Invest in padded moving blankets if you’re in it for the long run. 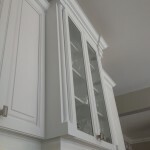 Summer Humidity: cabinet paint takes much longer to dry than normal paint, during the summer rush and when setting expectations with your clients remember that summer humidity will double the cure time of the paint. That is going to be a big deal when your sweet covered hands need to man handle those doors getting them back on to the hinges and on to the base cabinets. The longer the doors have to dry and cure the better the experience is for everyone.